I am a shallow man when it comes to cars. Looks are everything & there’s no doubting that the Stinger is a great looking car. KIA have built a bonkers 3.3 V6 version, but for our more humble fleet readers & with petrol on the up, we tested the entry level 2.0 T-GDi petrol version which can be had for just under £32,000. KIA love to give their customers a lot of standard equipment. Choose a premium German car, or something from JLR or Volvo & everything costs extra. Not so with the Singer. 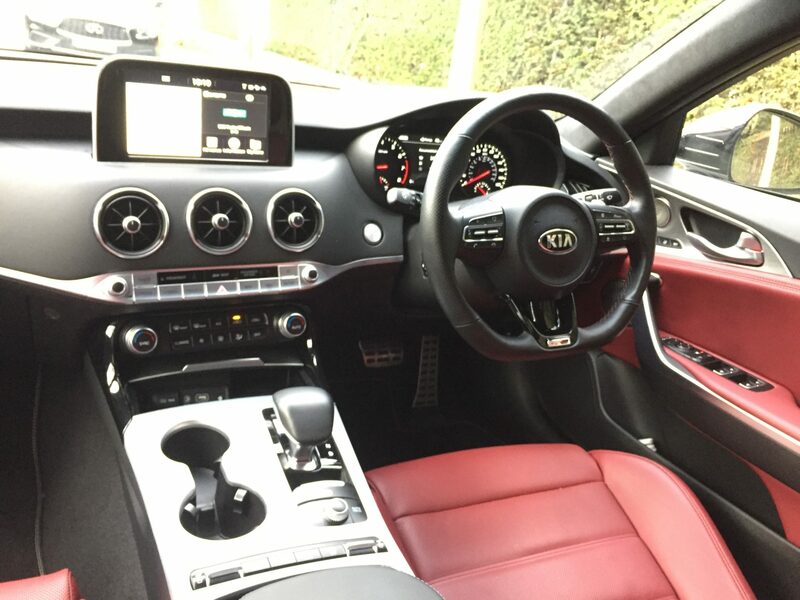 Included are 18″ alloy wheels, tinted glass, LED daytime running lights, a quad exhaust, projection headlights with manual levelling, dual zone climate control, leather upholstery, outer heated rear seats, front air ventilated seats, customisable heads up display, front & rear parking sensors, a rear USB charging point, Apple CarPlay/Android Auto with voice control, 15 speaker Harman-Kardon premium sounds system, it’s all included ! It’s not slow, either. With 244bhp, the Stinger 2.0 T-GDi will sprint from 0-60mph in 5.8 seconds flat & it will go on to hit 149mph at the top end. 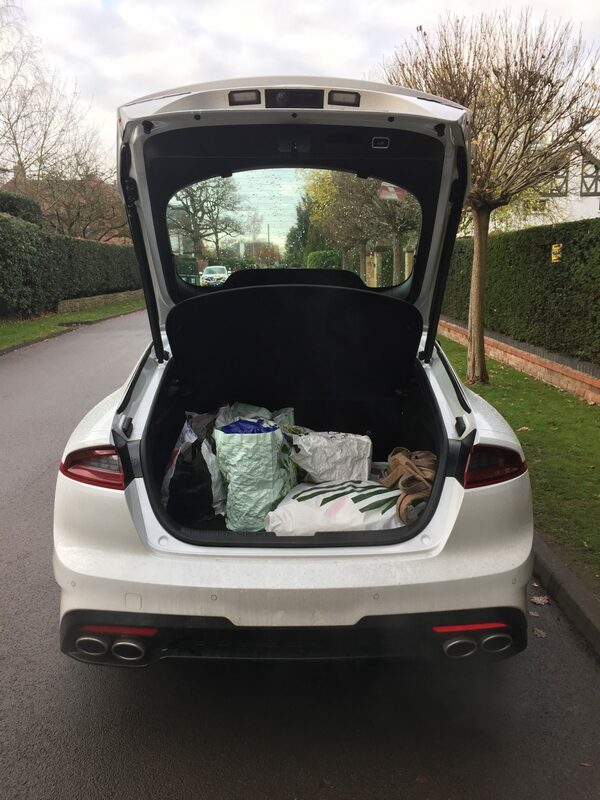 It doesn’t feel quite as bonkers as some of the German cars it competes with, the power is delivered more smoothly than in the BMW 4 Series coupe for example, but, in a way, the smoother delivery is more user-friendly. It’s also great to drive & one of the main reasons for this that it features a rear-wheel-drive chassis. Couple this with precise steering & an 8-speed auto box that adds a smooth gear change & you will not feel short changed. Choose Sport mode & the head-up display switches from conventional type to italics, a neat touch & even when I found myself on a couple of draining motorway drives, the Eco mode doesn’t reduce the fun too much & still makes this entry level Stinger a great motorway cruiser. The Stinger also comes with the option of Sport+, Comfort & Smart modes, all of which we tried, but in all honesty, Eco on the motorway & Sport when you get a chance did us fine. 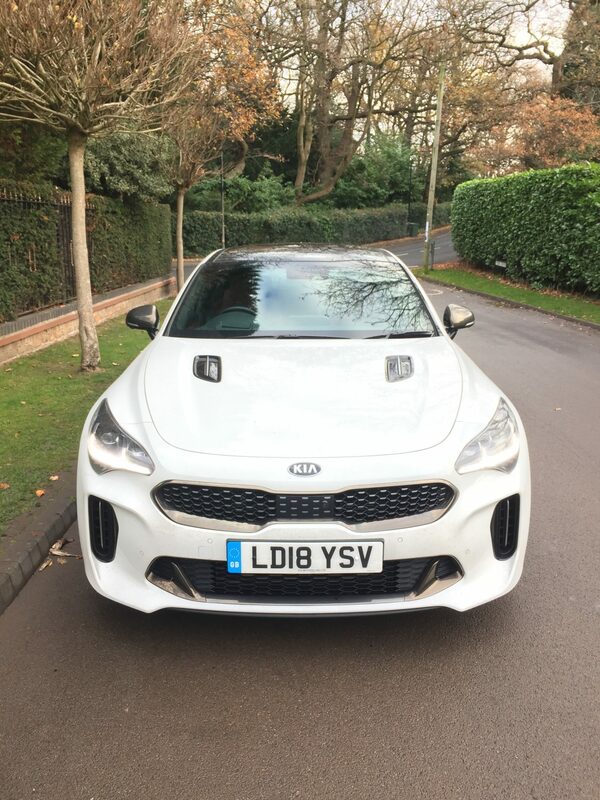 The sloping roof line would appear to make the Stinger impractical, but it’s not. Both front seat passengers get plenty of head & leg room & the two rear seats behind these, are surprisingly generous, with decent leg room on offer. The all-black roof lining makes the cabin feel smaller than it is though. For your odds & ends, Stinger offers two useful front door pockets, two central cup holders a usable glove box & a space to leave your keys in the centre binnacle. The boot isn’t bad either with 406 litres on offer & the split folder seat means that if needed ,you can load something longer in there. The build quality is pretty good. Yes, it’s not as good a the interior in a BMW or Audi, but nonetheless, it offers plenty of top quality plastics on the the dash & around the centre console & the attention to detail on the red leather seats for example, is clear to see. All of the switches & controls look & feel built to last & the 8″ touchscreen shared with other KIA & Hyundai models, is really intuitive & easy to use. Separate climate controls are a bonus too. Despite the clamour for petrol over diesel, the 2.0 litre engine is not that fleet-friendly, offering CO2’s of 191g/km coupled to a combined full economy of 33.6mpg. The fact is, that Kia’s 2.2-litre CRDi would be far more economical for high-mileage drivers. I managed a fairly dismal 28.9 mpg driving the Stinger over 300 miles on mixed routes & roads. I’d expect the diesel to offer closer to 50mpg which is sizeably better. Can it compete with a German car ? Not really, but if you want value for money in a sector where value is a bad word, then the Stinger would make a brilliant choice, especially in diesel form. A great first effort from KIA. 3.75/5.